On the mist-shrouded world of Ziem . . .
Eirlys Davorin, daughter of the "first family” of Ziem, feels ravaged by both the invasion of her peaceful world by the vicious Coalition and by newly discovered secrets that change her perception of everything she knows. Brander Kalon uses his reputation as a scapegrace gambler to get close to the Coalition and aid the rebellion. Every risk he takes is fueled by the desire to buy the rebels enough time to cobble together a plan to end the invasion for good. He also finds himself facing the wrath of an independent young woman who feels betrayed by his deception, by her brother’s secret life as leader of the rebellion, and by their determination to keep her safe and out of harm’s way. Eirlys clings to her burgeoning anger at what has been done to her world, and what those she had once trusted have kept from her. Only when she is at last free to fight back and join the rebellion does she begin to realize the true enormity of the battle they all face. And the kind of love it will take to survive. 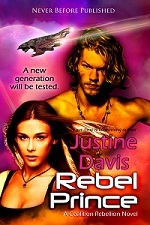 Their chance to save the rebellion will hinge on the most dangerous gambit they’ve ever attempted . . . . 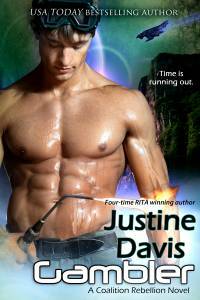 Author of more than sixty books (she sold her first ten in less than two years), Justine Dare Davis is a four-time winner of the coveted RWA RITA Award, and has been inducted into the RWA Hall of Fame. Her books have appeared on national bestseller lists, including USA Today. She has been featured on CNN and has taught at several national and international conferences and at the UCLA writer’s program. 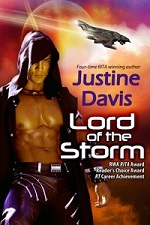 Find out more at her website and blog at justinedavis.com, Facebook at JustineDareDavis, or Twitter @Justine_D_Davis. THE MIST MADE the ruined building look as if it still smoldered. Thin wisps swirled here and there, appearing to rise like smoke before gradually blending with the heavier layer above. The mist was thick and low today, as if in mourning for the loss of what had once been the most popular stopping place in Zelos. Brander Kalon felt a jab of sadness—and anger—himself, since he’d spent many an hour in this taproom, sipping brew. And listening, ever listening, for no one paid much mind to what they said in front of the man looking only for his next game of chaser, never guessing who and what he really was. There was a movement behind him. Slowly, like a man distracted rather than afraid, he shoved back the hair that always seemed to fall over his brow as he turned. He’d known the man was there, had known the instant he’d arrived at the wreckage that had once been the prosperous taproom, but it didn’t seem wise to let the commander of the Coalition on Ziem know it. And this would make part of the plan even better, to have the top Coalition officer witness his presence here just now. He scowled at his occasional chaser opponent. He gestured at the destruction around them, retaliation for the decisive victory won by the man once known only as the Raider, but now known to one and all as Drake Davorin, son of Ziem firebrand Torstan Davorin and his pledged mate Iolana, a legend in her own right. "Come to see your handiwork?” Brander asked. Major Caze Paledan strolled through the wreckage as if he had all the time in the universe. Brander gave him a wry half smile, masking the fact that he’d known of the man’s return; reports had come in from several of the spies now eagerly reporting to the Raider in the wake of his greatest victory. He also noted that visiting this scene had been high on the man’s priority list, to come his first day back. Brander looked around again. They’d expected the Coalition to strike back at Drake in the only way they could, but seeing the destruction firsthand was different than knowing. "This is the first time I’ve had the stomach to come here,” he said, trying for equal amounts of aggravation and bitterness in his voice. It wasn’t hard, for he felt both in reality—over different things. "The Coalition is nothing if not thorough,” Paledan said, scanning the spot where they had once had several vigorous games of chaser. It was now a pile of rubble, the table they’d used reduced to dust and splinters. Given what he knew of Paledan, and of himself and his own hard-built reputation as an idler and a gambler interested only in his next game, Brander had pondered this approach, this reconnection, for a long time. Drake had argued with him, but he’d been set on it despite the risk. They needed a source in Zelos, and with Drake’s façade now as destroyed as this place, Brander was the best option. He just hadn’t expected that encounter to happen so soon, barely five minutes after he had reached the city. He wondered if Paledan had someone watching what was left of the taproom and the small house behind it that had been home to the Davorins for the three years Drake had played his dangerous game. "I’m saying my supposed best friend keeps secrets like a planium safe.” He turned, kicked at another chunk of wood, saw half a glass skitter away in the ash. "Being the brigand known as the Raider was not enough?” Paledan asked mildly. Damn, but the man was unreadable. Just as when he was playing chaser, there were no tells, no giveaways. "I still can’t believe it,” he muttered, making his way through the wreckage. "I believed he’d broken, but I never thought him a fool.” No matter how well he played the part of one, and a coward into the bargain. Sensing the danger lurking in the question, Brander calculated answers as he turned back to look at the man who was the final authority on the entire planet. Decided to answer honestly; the man was too clever to lie to unless absolutely necessary. Of course, the entire image Brander presented was a lie, but that façade was, in fact, absolutely necessary. In his own way, he’d been living as much a lie as Drake had been. Only the mask he wore was much closer to his true nature. Paledan smiled. Funny, Brander thought. The man was very different than the rest of the Coalition officers stationed on Ziem, and hardly seemed even the same species as the mindless troopers who marched to the Coalition tune in lockstep. Brander was usually an excellent judge of people’s motivations and often able to predict what they would do in various situations. But he didn’t understand what made this man tick, and men he didn’t understand made him nervous. "Not an issue for me,” Paledan said, his tone cool. Because it wouldn’t bother him? Or because he didn’t have a best friend? Or any friends? Brander had certainly never seen him with anyone, but as commander of all forces on Ziem, he had to hold himself somewhat apart. Funny, he’d never thought of how lonely being a leader could be until Drake had begun the resistance with a handful of rebels who took their name from the Sentinel Mountain that towered over Zelos. The few tastes he’d had of leading a Sentinel mission here or there and sending people into a battle were the worst moments he’d ever experienced in this fight. Well, that and Eirlys were the worst, but he wasn’t letting his mind go there, not now. He needed all his wits about him to deal with Paledan, and thoughts of Drake’s sister surely scrambled his head. Paledan lifted a brow. He seemed surprised at the question. He shouldn’t have been, given he had not only apparently believed Drake’s carefully constructed façade, but had faced the Raider in person and not tumbled to the secret. But Paledan didn’t know Brander knew that, had been present as protection for that meeting, but out of sight. Besides, he doubted a Coalition major would admit he’d been so fooled. Brander stared at him. All pretense, all thought of the façade he was trying to maintain vanished for a moment. "What a cold, lonely life you’ve chosen,” he said, his voice low. The moment the words were out the cool, unreadable expression was back. And it seemed impossible to Brander that he’d heard what he’d heard. He frowned. "Why are you here?” Paledan asked, cutting him off. Brander kicked at a beam that had collapsed directly across the entrance to the storeroom, where not so long ago he had hidden while Drake had sacrificed himself for his sister. That brute Jakel might be stupid, but he was also shrewd, and he’d grabbed Eirlys knowing Drake would give himself up to keep her safe. And I let him do it. For Eirlys. He forced his mind off that path. He’d come here in part to see if there was anything left, in particular something Drake wanted, but that hadn’t been the only reason. He just couldn’t put a name to the others. Again he looked at the man who was the commander of the enemy, the man who would no doubt be eventually charged with the task of wiping the Sentinels off the planet now that the rebels had taken out the fusion cannon and the Coalition’s ultimate leverage over Ziem. "Thinking,” he said flatly, "I’d much rather just stick to playing chaser.” And that also was pure truth. So he either had not heard or put no stock in the rumors that the healer of the mountain, the Spirit who dwelt above the Edge, had healed the grievously wounded Raider. Brander wasn’t surprised; Caze Paledan didn’t seem the type to believe in such mystical nonsense. Nor would he himself be, had he not been a witness. He would sooner believe in blazers, the stone called the Heart of Ziem, or even the lost tribe of the badlands. "Maybe Jakel isn’t as tough as he thinks he is,” Brander said. So he had Jakel’s number too. On the thought, the sound of a distant explosion rippled through the mist. Speaking of, Brander thought with an inward grin. The Raider had struck again. A legendary warrior and a slave with dangerous secrets. Bound by a love neither expected or wanted. The Coalition will do anything to stop him.